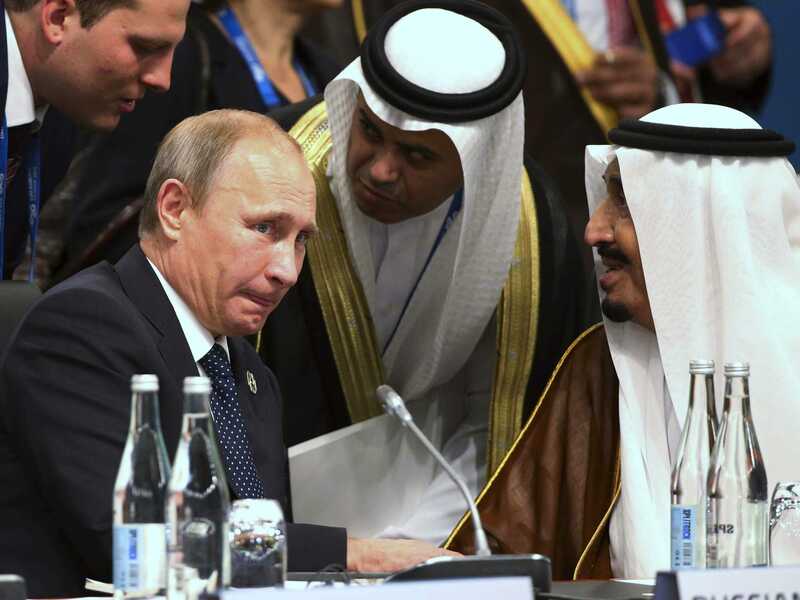 Rob Griffith/ReutersPresident of Russia Vladimir Putin (L) and Crown Prince Salman bin Abdulaziz Al Saud (R) of Saudi Arabia talk through their interpreters during a plenary session at the G20 leaders summit in Brisbane November 15, 2014. Saudi Arabia is risking the economic health of weaker oil producing nations in its fight to see off the threat of the US shale boom. Oil prices have fallen by over 30% since June and appear to be continuing their decline. On Thursday Brent fell to a four-year low of just over $US76 a barrel, down from $US115 a barrel in June, while US WTI crude dropped to around $US72 a barrel. The collapse has taken a heavy toll on states that rely heavily on exports of the commodity to support their economies. Below is a chart from Citi Group of the fiscal break even oil prices (the price at which revenues from oil sales will allow the government to meet its spending commitments) for a selection of oil exporting countries both within and outside of the Organisation of the Petroleum Exporting Countries (OPEC). What should be clear is that, although Saudi Arabia’s breakeven point has been creeping higher it remains substantially below some of the more vulnerable members. Unfortunately for most of the countries on that list, most forecasters now predict that the days of $US100 a barrel oil are now over — at least for now. 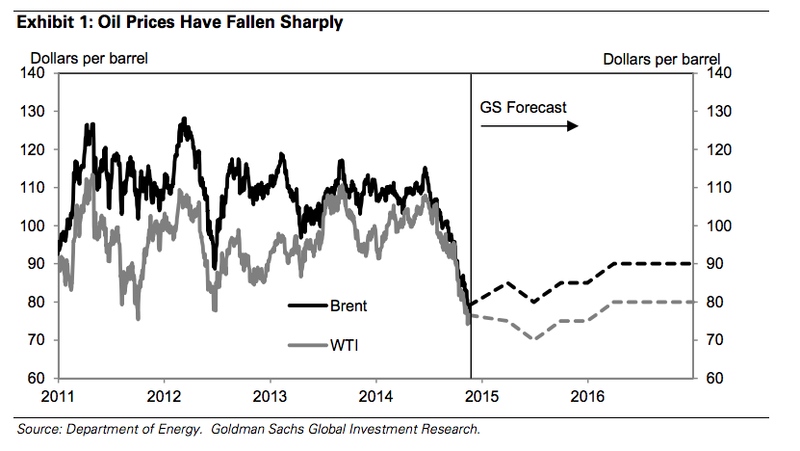 In a recent note Goldman Sachs estimates that Brent crude will hit $US90 again by 2016 with US WTI crude bouncing back up to $US80. 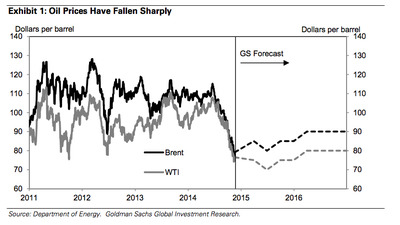 This forecast in large part reflects the huge shale boom that the US is experiencing. The country has seen production increase dramatically over the past couple of years, easily overwhelming cuts from OPEC members over recent years. And yet, the Saudi oil minister has been hinting that OPEC may not agree a cut to production at its key meeting on Thursday. Russian international reserves have plummeted by $US90 billion since the start of the year spent mostly in foreign exchange markets trying to prop up the rouble. Despite decades of commitments to diversify its economy, oil still accounts for 10% of the country’s GDP and around 50% of federal budget revenue. Morgan Stanley estimates that “every $US10 fall in the oil price means a $US32.4 billion fall in oil and gas exports, which is equivalent to about 1.6% of GDP” and around a $US19 billion fall in government budget revenues. And for Venezuela the situation is simply dire. According to state-run oil company Petroleos de Venezuela the country looses $US700 million for each $US1 a barrel decline in oil prices, a cost that the ailing state can ill afford. Adjusted for inflation the country’s real GDP remains 2% below its 1970 level and, according to US academics Carmen Reinhart and Kenneth Rogoff, it is now all-but-certain to default on its foreign-currency debt. Iran is also vulnerable due to international sanctions imposed over the country’s nuclear programme. Last month President Hassan Rouhani announced that Iran’s oil revenues had dropped 30% as demand slowed in its major export market, China. Rouhani said that the country would have to “deal with the new conditions and the global economic conditions“. 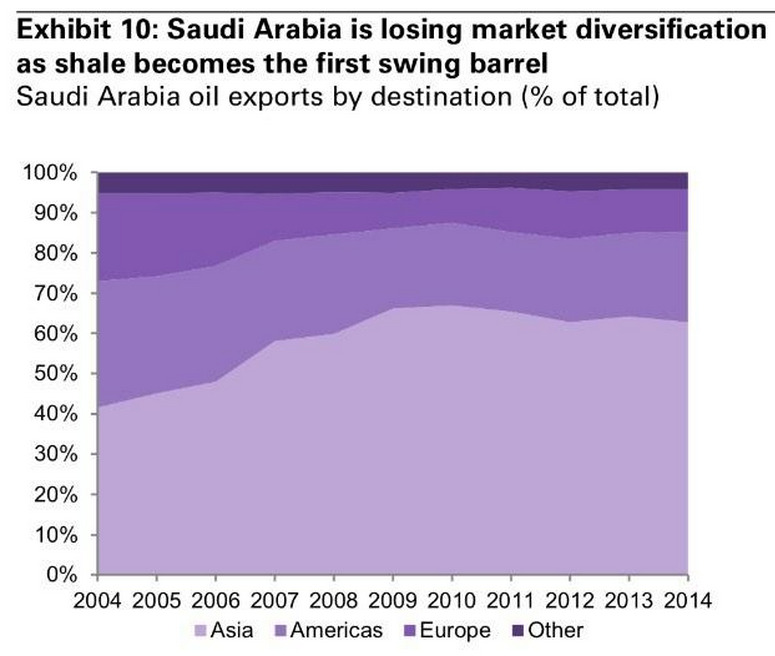 So why isn’t Saudi Arabia acting to help its fellow oil producers? One theory is that the Saudis are deliberately allowing prices to fall in order to fight off competition from US shale oil and maintain its share of the US market. Undoubtedly, it has come under pressure in what is a major part of the market and keeping prices below $US100 a barrel will put pressure on higher cost US shale producers. 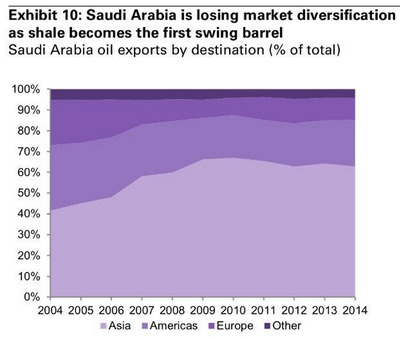 However, there may be a more fundamental shift going on in the oil market at the moment. The problem for OPEC is that it may no longer be able to control prices (as it has in the past) to avoid these problems. [There is a] realisation that the OPEC reaction function has changed and that the US shale barrel is now likely the first swing barrel … When Saudi Arabia cut prices to Asia for November delivery it was interpreted as a shift in the Saudi reaction function to a focus on market share. This should have not been a surprise in the new world of shale that has flattened the supply curve, as economic game theory suggests that they should not be the first mover and that the US shale barrel should be the new swing barrel given how easily it can be scaled up and down. This may explain Saudi Arabia’s unusual hints that it is now comfortable with sub-$US90-a-barrel oil prices — it doesn’t want to admit that its power to shift the price is drying up.